I have many times attempted to make the perfect caramel brownie, and with mixed results. The brownies that are topped with caramel come out great, but every time I try to fill the brownie with the caramel, there are issues. Now, at last, a solution! Rolos. Who knew? So obvious. So simple. So perfectly delicious! This recipe is an adaptation of one I found at My Baking Addiction and also of a Cooks Illustrated recipe. The brownie in the photo is simply filled with Rolos candies (milk chocolate covered caramels). I have left out the pecans because my family is allergic to them, but if you add them, you'll have yourself a wonderful, decadent turtle brownie. So, if you like ooey gooey, if you like caramel, if you like chocolate, this is the recipe for you! 1. Line a 9" square pan with parchment paper and spray with oil. Preheat the oven to 350°. 2. Put the butter, chocolate, and cocoa powder in a medium bowl. Microwave for 30 seconds, stop, and stir. Microwave for 15 seconds, stop, and stir. Repeat until the mixture is melted and smooth. Set aside. 3. In a small bowl, stir together the flour, baking powder, and salt. 4. In a large bowl, beat the eggs. Whisk in the sugar and vanilla until thoroughly mixed. 5. Slowly whisk the chocolate mixture into the egg mixture. Whisk until completely blended. 6. Stir the dry ingredients into the wet, just until incorporated - do not overmix. 7. Spread one cup of the batter into the prepared pan. Spread evenly with an offset spatula. Bake for 8 minutes. Remove from the oven and allow to cool for 10 minutes. 8. Meanwhile, unwrap the Rolos. 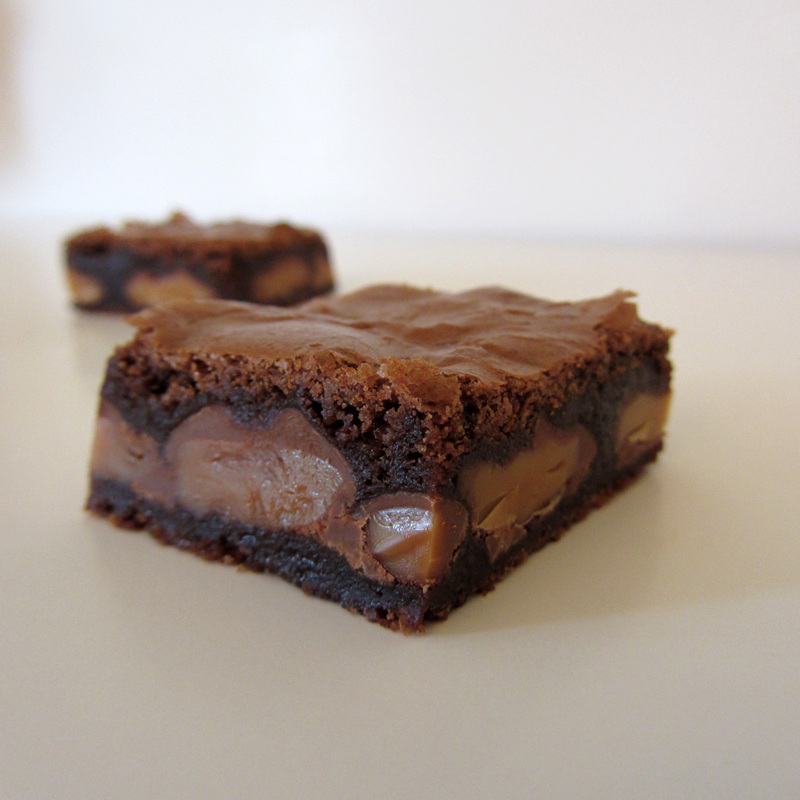 When the 10 minutes is up, place the Rolos in an even single layer over the parcooked brownie. I used 56 candies (the one leftover from the bag was for quality checking, among a chef's most important responsibilities). 9. If making turtle brownies, sprinkle the pecans evenly over the Rolos, allowing the nuts to fall in between the candies. 10. Scoop tablespoon sized portions of the remaining batter (I used a small cookie scoop) evenly over the candies. Use an offset spatula to spread the batter as well as you can in an even layer over the top. The batter will sink into the spaces, you do not need to press at all. 11. Bake for about 30 minutes, or until the edges begin to pull away from the sides of the pan and a toothpick inserted into the center comes out with only a few crumbs attached (you may need to test in more than one spot as inadvertently stabbing the caramel will skew the results). 12. Transfer the pan to a rack to cool completely. Cut into squares and serve!